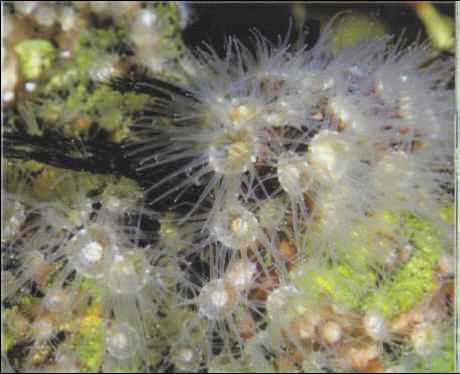 This colonial anemone consists of small polyps which can reach a height of up to 2 cm, with tentacles that do not exceed 5 mm in length. They must be placed 10 or 20 cm under the water surface in an aquarium to take maximum advantage of the light, due to the presence of Zooxanthellae. They must not be put close to stinging Anthozoa. Like many other animals in this group, their food consists of a fine choppy based on mussels. When buying this encrusting anemone, make sure that it is attached to a rock. МЕРЗЛЫЕ ГОРНЫЕ ПОРОДЫ , горные породы верхней части земной коры, содержащие лед. По длительности сохранения льда делятся на кратковременно- и сезонномерзлые (менее года), перелетки (от года до 2 лет) и многолетнемерзлые горные породы.